'Natch by now, I will break down flavors into categories as you will see below. I then shall note any flavor which arises. Too, I will grade according to my K A P L O W I T Z Scale guidelines. This all shall be noted and notated at every 1/3. I will then offer a final grade ruling. 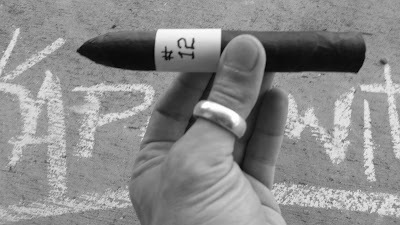 THEN, on ye next Radio Herf (check yer local listings), Mr. Darryl Martin shall reveal what it is that I reviewed. We'll kibbitz 'bout it. Blind review, yes? Oh, yes. Blind review. Sweet: Dried fruit. Honey. Creamy. Caramelized sugar. Black Cherry. Bittersweet. Spicy: Chili pepper. Cinnamon. Mulling Spice (w/citrus rind). Salt. White pepper. Woody: Oak wood (mainly generic). Cedar wood. Vegetal: Bell Pepper (trace on finish). Cinnamon raisin bread, toasted, placed warm on butcher block. Dried fruit note is purely raisin. Honey/creamy are tandem and light. Top-leaf cracks 3/4" ahead of burn a few puffs in (came slightly damaged). Cinnamon raisin toast dials back and inch in. Peppers and gamey note muscle. ...citrus up-ticks, balances gamey. Woods get bigger, still rather generic. Wood shavings? Pale, sturdy ash; even at top-leaf bugaboo. Flavors thin, but last longer. Kinda flow together. Odd finish. Cedar comes in near an inch. Seems to need a good majority of the 1/3 to settle its profile. Packaging has softened a bunch off last couple pulls. Sweet > spicy > sweet: all in 1/3. Pre-existing bugaboo in top-leaf gets smoked through. Lagging construction: Seam loosens a tick at burn. Dense dry ash rolled off at inch+. Burn wavers. Sweet: Fresh fruit. Honey (very thin). Creamy (muted). Sugar. Black Cherry. Bittersweet. Spicy: Chili pepper. Cinnamon. Salt. White pepper. Cloves. Woody: Oak wood (mainly generic). Cedar wood. Toasted. Aromatic tobacco. Vegetal: Bell Pepper. Floral. Citrus. Earthy: Dust (lessens). Moss. Peat. Citrus flexes more, gets juicier. Other fruits added. Cinnamon raisin note is all but gone. Very leathery -- missing chart. Smallish re-touch of line. Eagerly accepted. Flavor profile remains somewhat unsettled. Bread comes in, a rye. Again -- missing chart. Smoke gets a blue-green tint. Packs softens noticeably. Draw dampens, flavors too. Burn-line wavers. Another re-touch, accepted. Very fruity with bread and leather. Not much added on retro-hale. Sweet: Fresh>Dry fruit. Honey (very thin). Creamy (on finish, underneath). Sugar. Black Cherry. Woody: Oak wood (mainly generic, less). Cedar wood. Toasted. Aromatic tobacco. Vegetal: Grass, fresh. Hay, fresh. Bell Pepper. Floral. Citrus. Nuts, raw. Earthy: Dust (mouth-feel). Moss. Peat. Chicken coup. Ash re-pales. Smoke back to white. Lots of leather oils, seen on shaft as well. Clean, but a tick dry mouth-feel. Flavors mottling a tad (purge). Flavor notes are somewhat hard to separate. ^unchanged 2/3 notes marry a bit and alter thusly. Seams comes a tick loose at burn+ 1/4". Vanilla note stays for an inch. Packing near completely re-firms near band. Goes out with a bang in a way quite like 1/3. Never seems to settle and accomplish what it sets out to do. Totally enjoyable smoke (sans more re-touches than I'd like), but with my pretentious critic's hat on -- it misses more shots than it lands. REMEMBER: Tune into the next Radio Herf (check local listings) for the reveal. POSTSCRIPT: In the interest of uniformity, I will be working from a flavor chart via Stogie Fresh.